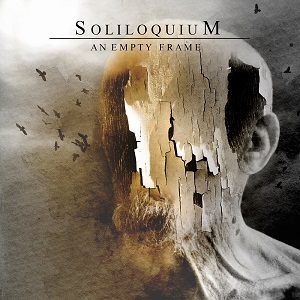 “An Empty Frame” is the full-length debut from Swedish death/doom metal band Soliloquium. It was released on U.S. label Transcending Records in 2016. You can download or stream the release for free from the Soliloquium Bandcamp page. To release a Soliloquium full-length was a dream come true, but it was also an immense hassle. The process for this album had me giving up the project and almost music altogether several times. After finally getting the project audio files together, Mike Watts from my friend’s band Sleepwalkers swooped in and saved the day with great sound design, mixing and mastering. Twists and turns aside, it was weird to release what was essentially a 2014 album in 2016. I got out of touch with themes and feelings in the songs. On the positive side, songs for 2018’s “Contemplations” were fully fleshed out before this album was even released. The songs and themes carry on where 2013’s “The Concept of Escape” left off, but with a broader scope. It’s still very much an internalizing, inward facing experience, but it dwells in more specific topics: picking up at rock bottom and using it as a driver (“Eye of the Storm”), anxiety and mental illness from a social perspective (“The Observer”, “Procession”) as well as some nostalgic Stockholm night gazing (“The Sorrow Path”). Musically, it’s another step away from standard death/doom towards something more unique. The guitars for “An Empty Frame” were recorded with an ESP Ltd F-400FM tuned to C#. “Eye of the Storm” is in drop B. There are also acoustic guitars in several songs. A special mention goes out to Oliver Palmqvist from Swedish death metal band Phidion, who made the cover art of his life for “An Empty Frame”. The Travis Smith style artwork is by far the best looking Soliloquium cover. It also perfectly catches the album’s atmosphere. “An Empty Frame” on Bandcamp. “An Empty Frame” as well as the demo/EP collection “Absence” from Transcending Records is available on Spotify. Recorded during 2014 and 2015 in Stockholm (various home studios and Forlorn Halls Recordings).